A city with a long history and a vibrant cultural and culinary life! More recently, Lyon became known for its gourmandise, with local chef Paul Bocuse being a famous exemplar of Lyonnais culinary art. It is also known as a banking center, and for its chemical, pharmaceutical, biotech and video-game software industries. Lyon's two rivers, the broad, swift Rhône and the narrower, more placid Saône, will shape your visit as they shape the city. They define its long narrow presqu'île (peninsula) stretching from the high Croix-Rousse hill in the north 5 km (3 miles) southward to the confluence, or meeting of the rivers. 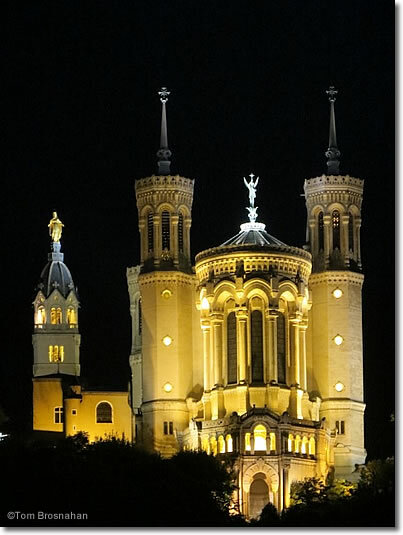 West of the peninsula, on the west bank of the Saône, another hill, Fourvière, rises over Vieux Lyon, the oldest and most charming part of town. 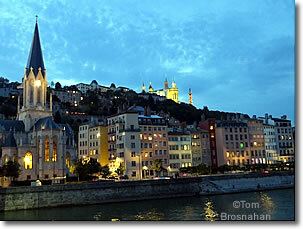 Above, Vieux Lyon at dusk.